An update on how to get Wifi cover during your motorhome travels in France, on up to 10 different devices, without breaking the bank! 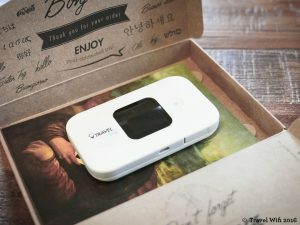 We recently blogged about Travel Wifi (a company that provides mobile Wifi hotspots, also known as “Pocket Wifi” or “Mifi”), but at that point we had never actually seen one of their “hotspot” in the flesh. Now we have, and we are seriously impressed. The nice people at Travel Wifi wanted us to experience their service, so they sent us one of their Wifi hotspots to try and it is brilliant. The product and offer is simplicity itself, as they send the Wifi hotspot device to you (or to us so it’s here when you arrive to collect your motorhome), you switch it on, tap in the code provided and it works! 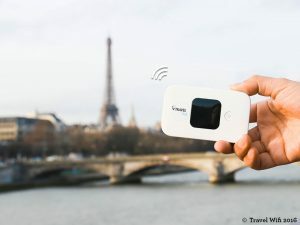 It’s a small device (measuring about 10cm x 6cm x 1.5cm – the size of a pack of cards) that picks up the French 4G network, creating a Wifi network around the user, us in this instance! The Travel Wifi comes in a recycled box with charger, manual, prepaid return envelope and even a “Le Sable” cookie by Michel et Augustine! We even took ours to the Morvan National Park (where coverage is usually really patchy on our phones), and it worked perfectly there. When we were ready to send it back, we simply put it back in the envelope provided and dropped it into the nearest mail box. This is a really simple solution if you want to stay connected whilst on the move, and is especially good if you don’t speak enough French to be able to tackle the more complicated connection options available. You can read more about Travel Wifi’s offer (and other’s) here. ← Yippee, an English-speaking hairdresser in Sens!